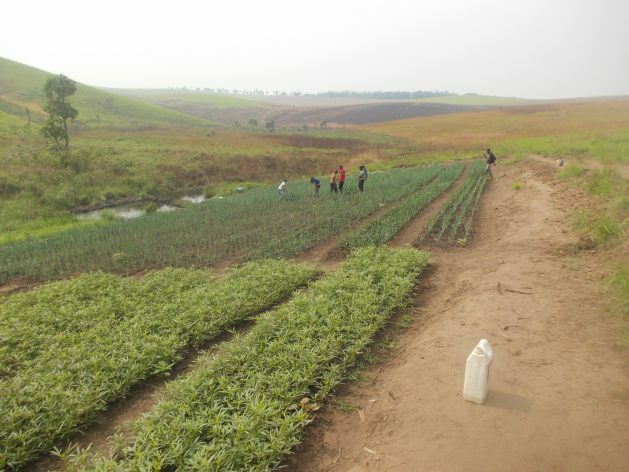 KIKWIT, DR Congo, (IPS) – It was almost four years ago in 2015 that members of Farmer’s Frame of Idiofa (FFI), a farmers group in the Democratic Republic of Congo (DRC), produced a mere eight tonnes of sweet potatoes on two hectares of land. But the main reason for the low yield had not necessarily been a climate-related one, but an educational one. The field schools are not necessarily a new concept. According to a survey they were first introduced in 1989 in Indonesia where schools were developed to hope farmers deal with pesticide-induced problems. Lazard Milambo, an FAO expert says that the new element to the FFS is that farmers are introduced to “new ideas with guided exercises without imposition and stimulating discussions by farmers.” He says the involvement of farmers themselves in the training process is also new. With the FFS, however, farmers are not just told about new techniques and research, they are able to implement it also. Each week, a group of 20 to 25 farmers meet in local field and under the guidance of a trained facilitator they implement new farming techniques. Facilitators have various backgrounds and can include extension workers, employees from NGOs or previously-trained farmers. In a country with 80 million hectares of arable land, “there are more than 50 millions of farmers in the country with land. Most of them are smallholders,” Milambo says. And according to the same World Bank report the government is, however, committed to a green revolution, pledging to reduce rural poverty by 2020 through agricultural production systems. The government allocated 8 percent of its 2016 budget to agriculture. Farmers and smallholders instead rely on the advice and knowledge of agricultural extension officers. And now, as Milambo points out, about two million smallholder farmers are working across the country with some 20,000 FFSs. Françoise Kangala, a 47-year-old farmer of Kongo Central (formerly Bas-Congo)province explains that he learned a lot from the course, including how to identify the best field for planting his crop and how to choose top seeds. His increased knowledge showed in the increased harvest. For John Masamba, a smallholder farmer from Goma, North Kivu province, east of DRC, it’s necessary to popularise this system around the DRC “because it’s a school without walls.” He said he appreciated learning through practice. “Together, farmers swap experiences. With the knowledge from FFS and using resilient seeds, I have produced [in 2018] 19 tonnes of maize from one a field of one hectare, compared to 7 tonnes in 2016,’’ he says. Going forward this increased production by smallholder farmers will be crucial to the country’s food security. Smallholding farming contributes — around 60 percent — to the country’s food security, according to Milambo.